Does the Moby Sprout Cover Really Work? There are so many items that need to be bought for a baby as they go through their growing stages it can be difficult to keep up with this. Some items are more important than others. The ones that are at the top of the list are those that are going to help create a safe environment for the little one. A product that fits into this category is the Moby Sprout Cover. The Moby Sprout Cover is a small pliable device that fits over most bath sprout. 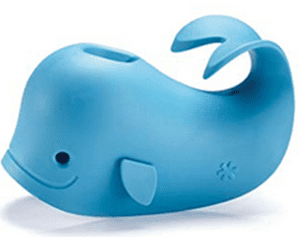 It is designed like a whale so the kids are really intrigued by it. The Moby Sprout Cover has been designed to fit over the sprout of the water supply for the bath. The sprout is something that the kids can easily bump their heads on even though they are being closely supervised while bathing. The promoters of the Moby Sprout Cover say that it fits snugly on the sprout. Then when not in use the tail of Moby can be used to hang the device so it is easily accessible for the next time it is going to be use. It is BPA and PVC free as well as does not contain Phthalate. The hype that surrounds the Moby Sprout Cover is that the kids find it super fun to look at and the parents have peace of mind that there is one less thing to worry about when it comes to the little one’s safety. The commitment for the Moby Sprout Cover is not only to remember to use it but to discourage the little one from trying to take it off the sprout. This is not meant to be a play toy but is a form of protection so they don’t bump their heads or hurt themselves in other ways on the sprout. Overall the Moby Sprout Cover is a very innovative idea. Although it is soft rubber it provides good protection. It is also convenient to keep clean because it can be cleaned in the dishwasher. It is also mold and mildew resistant. At first we were reluctant to accept that an item such as this would be all that popular. We were soon proven wrong as there are several reviews that pertain to this item. Many of them are favourable. Out of 436 reviews it has received a 4.5 star rating with 71% being a five star. So there is no doubt that many parents feel that there is a need for a product such as this. We are going to give the Moby Sprout Cover a thumbs up. It is reasonably priced, is a good safety product and is quality made. It would make a great shower gift for the new mom to be. There are a lot of great baby products on the market that makes raising a baby a whole lot easier. One of these is the Munchkin Wipe Warmer. What do you think? Does the Moby Sprout Cover work or not? Does Ella's Clear Corner Protectors Really Work? Does the Snoo Smart Sleeper Really Work? Does Earth Mama Organic Diaper Balm Really Work?